While many of us in the West are still obsessing over rare items to forge that sword we always wanted in Monster Hunter 3 Ultimate, 3DS owners in Japan are already looking forward to the arrival of Monster Hunter 4 this Summer. Alas, those of us in the West probably have quite a wait ahead of us for that one. But still, that doesn't mean we can't gaze longingly at what's to come in the future. 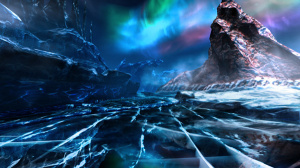 Gematsu has posted a lot of new screens for the title, which for the most part show the new Frozen Sea area and some of the monstrous abominations that inhabit the land. We can see some new creatures and old favourites, and lots of warriors having a bit of bother in battles. Check out all of the screens below (click to enlarge), and wish against all hope that one of these lovely Nintendo Direct broadcasts will confirm a Western release this year. We like to dream. Amazing shots. Want this game, but still have 100s of hours to sink into MHTU for now. But will enjoy this when it comes out in 2014 hopefully in the US. This is what the Wii U version should have looked like, not the ported version we have. @mr_moobs Yeah, I don't think you'd be satisfied with this on Wii U at all. The textures are reeeaally low in some shots (especially on the ground itself). Hopefully the visuals will improve, but I still don't think you want this playing on an HD system. I am sorry, but this looks really disgusting. Like early PS1/2 game. Are those screenshots correct version? 3DS owners in Japan are already looking forward to the arrival of Monster Hunter 4 this Summer. I was going to say thay where is pretty poor for a Wii U version, but saying that usually its the last 6 months of development where they really polish the game, and the fact it for 3DS. 2nd Screenshot = Hogwarts in winter. Yeah..... Monster Hunter doesn't interest me at all. Played the demo on WiiU and 3DS and I couldn't get into it. So pass. Looks beautiful,hopefully we might get it sometime next year. @NinjaWaddleDee did the same thing played the demo didn't like it but then I brought it and I'm addicted. I had the same thing with dead space and blue dragon. Sometimes demo's damage game sales! The demo was horrible and didn't show what most of the game is about at all. @SetupDisk ha ha zenny. Yes, the only currency Capcom deal in. I still have not taken the plastic off mh 3 ultimate or mh tri. I always put it off thinking one weekend i will be ready to take on a quest of this size but never seems too happen. Playing a lot of monster hunter 3 ultimate now, online. It will be the case till monster hunter 4 ultimate will hit on my wii U, and judging by most players I'm not alone. I hope they develop this or some other wii U 4 version alongside in hd. That will make it the cream of the crop and really hit home. Loving this series so far. Nice, I always love ice/snow-themed levels. I really dig the direction of the art style they are going with. It looks quite a bit more diverse and detailed than Monster Hunter 3 Ultimate. I guess we might get to play this game a year after its release in Japan. Don't come so early, I'm just scratching the surface of MH3U. And I haven't gotten a 3DS XL yet. It's a port, what the heck did you expect? At least the textures look much better in the Wii U version than the 3DS version of the same game. MH4 is a completely new game with new assets and a hell of a lot more work put into it. Textures on environments are looking nicer and nicer. Some places are still blurry, but that's fine as long as other parts of the game look fine. It's not like PS3 or 360 games have consistently high quality textures anyway. @Fafulec "Like early PS1 game"
Looking good, as far as I'm concerned they can take their time bringing it over though. It hasn't been all that long since the rest of the world got MH3U so theres no rush. Do you even know what an early PS1 game looks like? This doesn't look any worse than earlier games in the series, which isn't that bad considering the size and scale they seem to be going for. Loving it. I would like to see it come West sooner rather than later. I don't mind it siting on my shelf while I finish MH3U. It took 2 years to localize 3 Ultimate so who knows how long it will take to reach us. HOWEVER a Western release is not guaranteed. If 3 Ultimate did well, then it will come. Every single Monster Hunter release does not make it here, but it looks likely since both Tri and 3 Ultimate have. @SetupDisk You're absolutely right, the demo was horrible. The easy level was too difficult and the Lagombi is hardly the best choice to represent the amazingness of Monster Hunter. The hard level was Plesioth, they could have chosen a better monster but technically if you already know how to play at high difficulty, you're already buying this game.